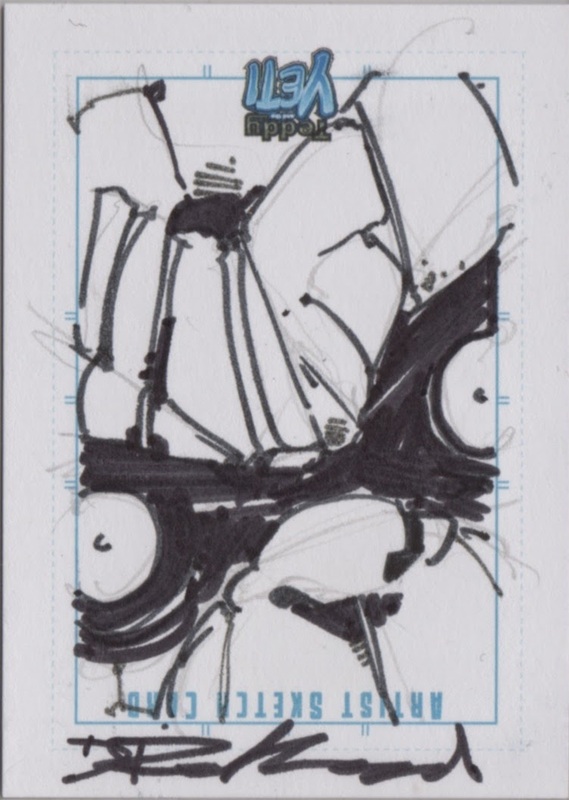 It's time to look at some new Thing sketch cards that have made their way to my collection. HOW EXCITING! 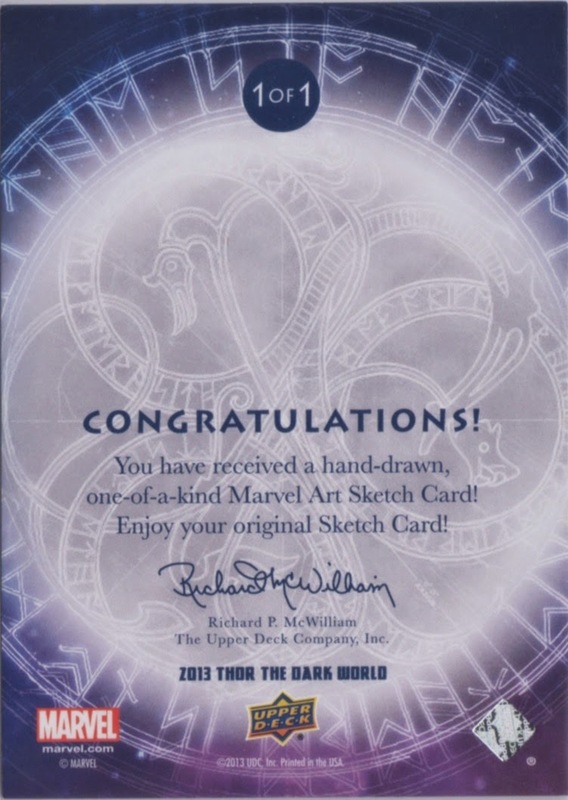 Thor: The Dark World card - This lovely signature-less card will most likely forever go without the name of the artist attached, but perhaps someone in the know will one day stumble upon this image and illuminate the rest of us on just whose art adorns this sketch card. 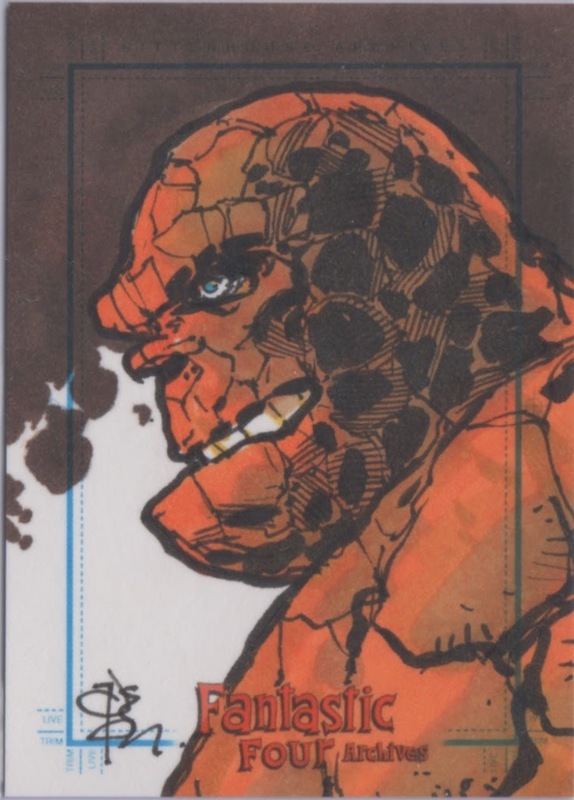 There's a lot to like about this card, starting with the fact that the mystery artist took a card from the Thor movie trading card line and, instead of choosing a character like Odin, Sif, Jane Foster or...Thor...decided to draw the Thing. This color pencil masterpiece also includes the Thing in a checkered shirt, which is just classy. Here's the back of the card! 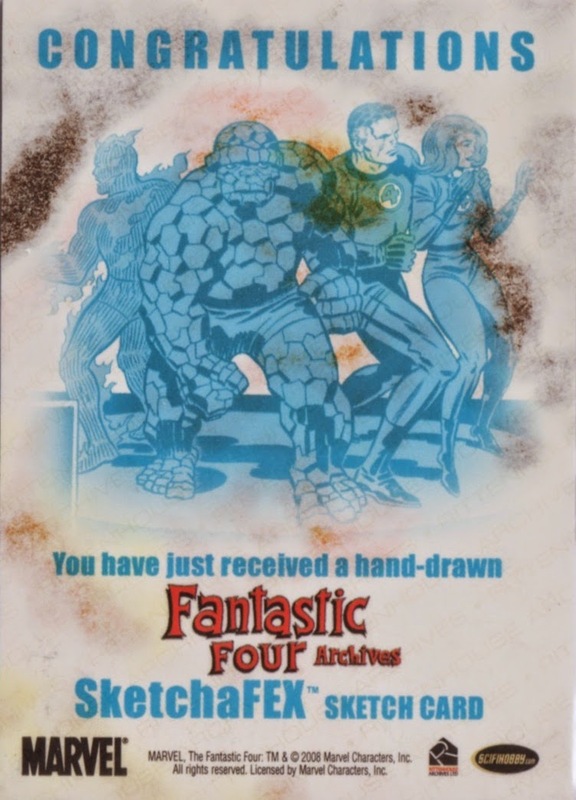 The reproduced signature is of Richard McWilliams, not the artist but from the Upper Deck trading card company. Duane Redhead - During Duane Redhead's recent stateside trip, he drew a lot of sketches, mostly of the Tick and Arthur (for obvious reasons). 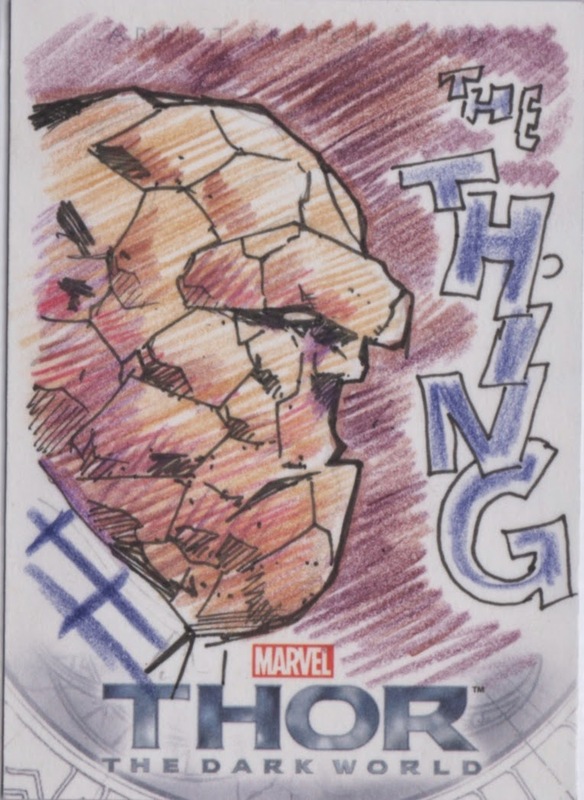 Near the end of his trip, while Duane and I signed some books at Pittsburgh Comics, I twisted Duane's arm enough that he also drew the Thing a few times...including on this Teddy and the Yeti sketch card. This closeup is, if you can't tell (come on, guys), of the cosmic ray-infused "pineapple" Thing, who totally beat up the Hulk. Sharp viewers will note that the T&Y trading card is upside down (or is it the Thing?). Larry walked away from the signing with cards of both the Tick and Arthur, which I'm hoping he'll scan and share soon. 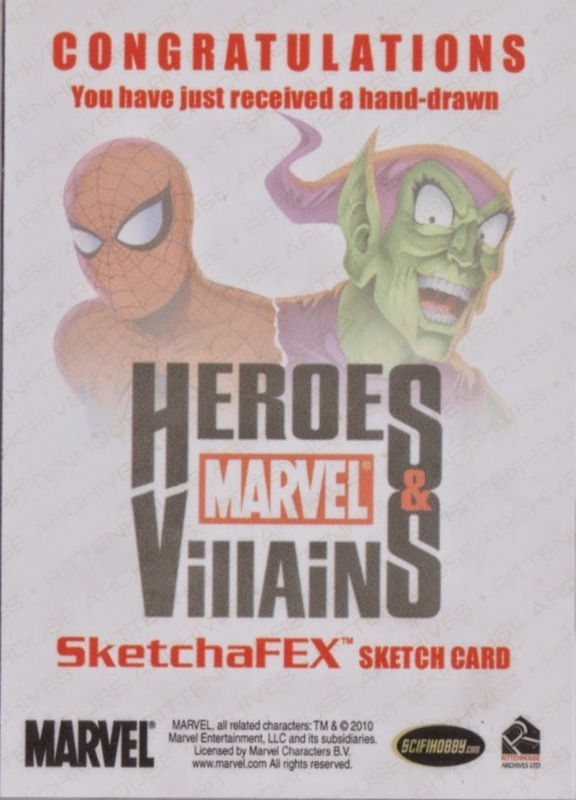 Mark Dos Santos - This Marvel "Heroes and Villains" sketch card comes courtesy of Mark Dos Santos, who for whatever reason decided to forego the villain and just draw two heroes. 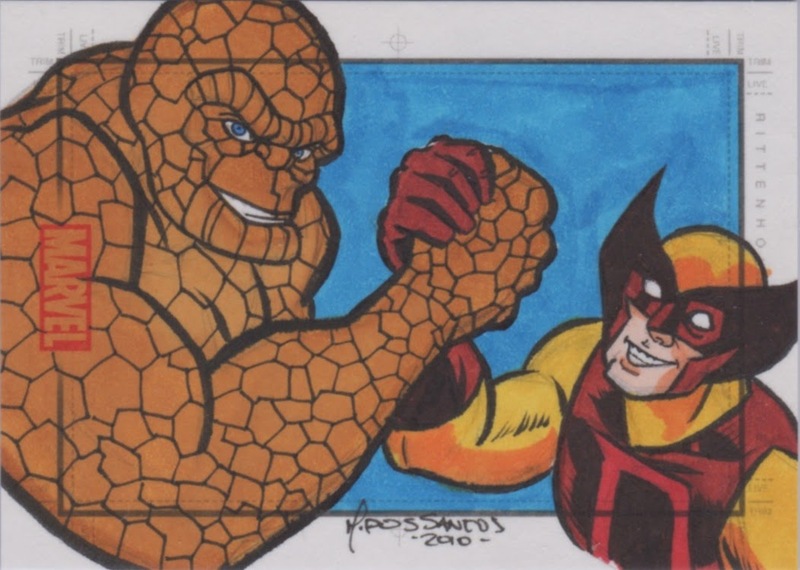 At first glance, it looks like the Thing is sharing a moment of camaraderie with Wolverine, but the character is actually D-Man, who couldn't decide on his own costume and instead wore an original Daredevil outfit with a Wolverine mask. 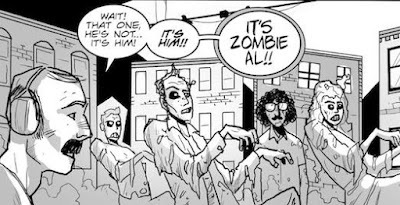 D-Man's alter ego first appeared in the original Thing series, so there's something of a connection between the two. D-Man was originally called "Demolition Man", and I can't help but wonder if the name was shortened because of the Snipes/Stallone movie. Heeeyyy...here's the back of the card. Bub Shehi - This homemade card features lots of action lines! And it's by "Bub" Shehi. I bought it for a dollar on eBay, and it came with free shipping. When I got this in the mail, I noticed that it cost the seller over two dollars to ship it, which means he lost money in the transaction. Sorry fella. It's a cool card nonetheless. Tone Rodriguez - I've been hoping to get some art from Tone Rodriguez for a while now. Rodriguez has drawn the Thing a number of times before (most notably for the Hero Initiative) and he always manages to impress. It seems that he really enjoys drawing the Thing and he adds a lot of dynamic energy when he does. When this card showed up on eBay, I snatched it up right away. I'm loving the colors that, as you can see below, bled all the way through the card to somehow frame the Kirby Thing printed on back. 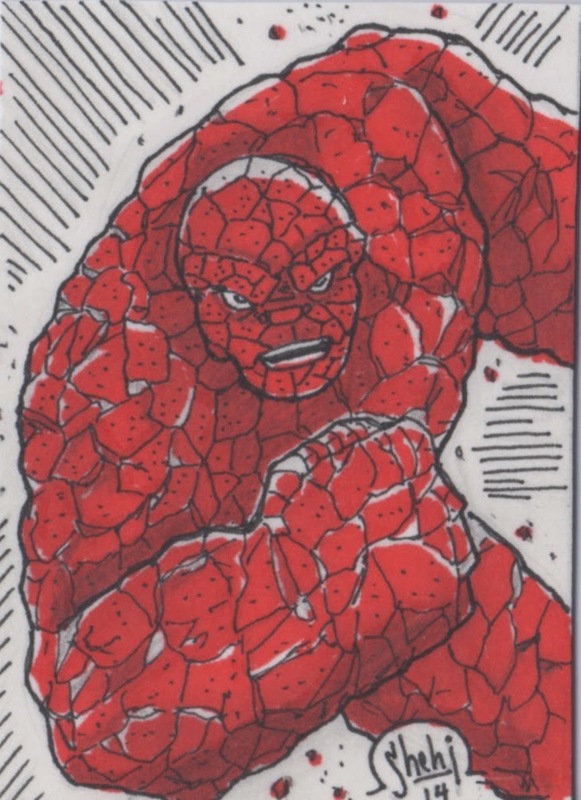 It's my second sketch card from the Fantastic Four Archives set. Well, that's it for now. More to come...later. 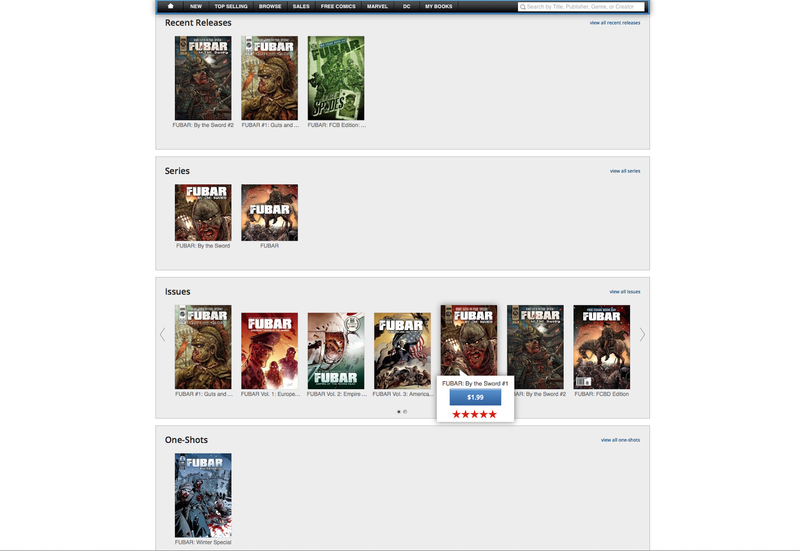 For those of you who like to read your comics on your computer, phone, iPad or whatever, I bring good news: the FUBAR catalog is now available for download on ComiXology, the premier site for digital comics. This will give you some idea of how long I've been working on the property and the number of books we've put out: I'm not sure if those listed are all the ones we've done. But it looks fairly complete save for the FUBAR Summer Special (I have no idea why that one's not on there, though most of the stories contained in there can be found in the trade collections) and the newest issue, Better Red than Dead. There are some great deals to be had, and none better than on the trades. Volume 3, a massive, phone book sized collection, is only $6.99! Single issues are only $1.99, and the FCBD issues are there to download for free! 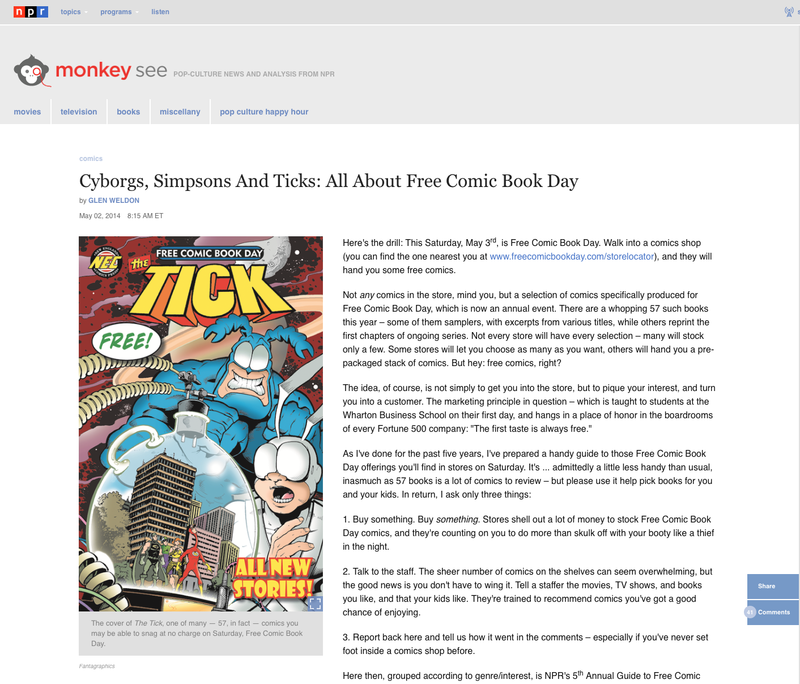 ComiXology was recently purchased by Amazon, which adds a fair amount of stability and recognition to the site. Time will tell if it is ultimately a good thing for creators and fans. 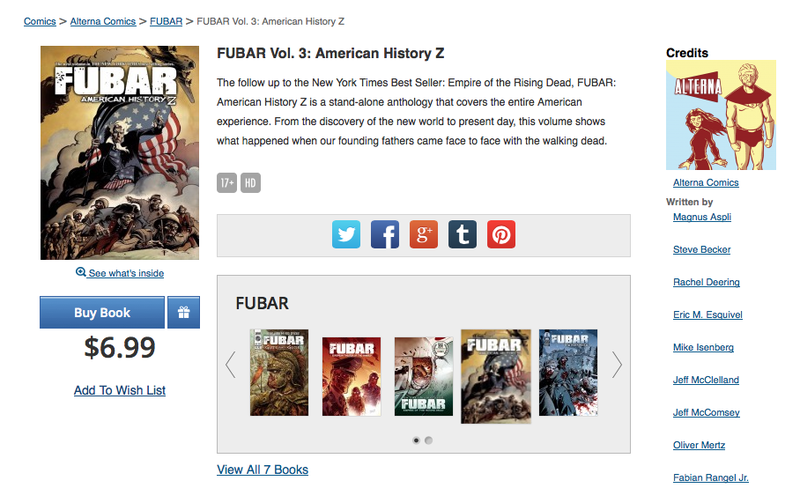 For now, I'm excited that the work we've done with FUBAR is available worldwide like never before. I picked up a few back issues on my last trip to the comic shop, and among them was a Superman annual from the '90s. Near the back ran an in-house ad for DC's then upcoming sci-fi imprint, "Helix". 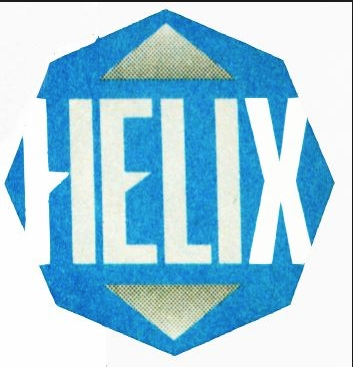 As we can see from the above image, Helix was actually the second choice for a name, as the previous one apparently met with some resistance. If I remember correctly, the original announced name for the line was "Matrix", which obviously evokes some other imagery in lieu of the seminal movie of the same name. The movie series started in 1999 ("I know kung-fu") and the Superman annual was printed in 1996. Both DC Comics and the Matrix are housed under the Warner Bros. parent company, so you'd have to believe that someone from one branch informed someone from the other of the name, but we're talking about three or four years, here. Would it have been that big of a deal? As it turns out, it wouldn't have mattered anyway, because the imprint died out in 1998 after a few short months of publication (a few titles were carried over into the Vertigo imprint, such as Transmetropolitan). So all of that hand-wriging was for nothing. There were, however, some fairly big names attached to some projects (Tim Truman, Garth Ennis, Tommy Lee Edwards, Howard Chaykin), and I seem to vaguely remember the character Cyberella...but then again, I may just be thinking about Striperella, who was a somewhat different character. Oh well. It was bound to happen, or so we all had hoped. 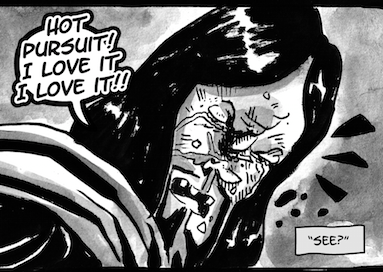 Larry Franks, creator of DukesCollector and co-creator of Franks and Beans has joined the ranks of FUBAR, contributing his first story to the upcoming FUBAR: By the Sword collection. Needless to say, Larry has been one of my favorite comic book writers for years. 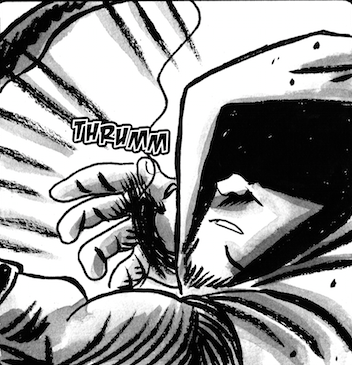 Larry's story takes us back to the origins of the Robin Hood myth in a way that incorporates classic literature with his very real love of puppet shows...and zombies. I can't wait for everyone to see what he's done with this story. These panels are just a hint of what's to come. 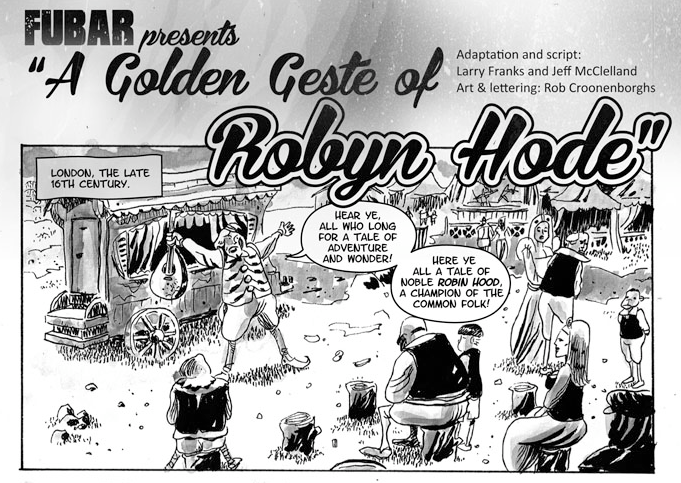 Be sure to check out this story in the new FUBAR collection, as well as Larry's other works through the usual channels. Very excited to see this take shape.